Relevant literature for AOT cases was identified by searching PubMed (Medline) database. The word "AOT" yielded 264 results out of which many reported cases mentioned about some distinct feature associated with AOT, may it be of clinical, radiographical or histopathological relevance. Hence, we the authors take the opportunity to report a case with a new distinct finding of pathological relevance and review of literature with the same. A 20-year-old female patient was referred to our outpatient department for evaluation of an asymptomatic swelling in left maxilla that was present since 3 months. Her medical history was otherwise non-contributory to the chief complain. Clinically, the area was grossly deformed though skin over the lesion appeared normal. There was no sensory deficit or nasal discharge observed. Intraoral examination revealed expansion of both buccal and palatal cortical plates of the left maxilla from deciduous canine to third molar region with intact overlying mucosa. Panoramic radiograph showed a unilocular radiolucency extending from distal root surface of 21 up to maxillary tuberosity region with impacted 23. Root displacement of 22 and resorption of roots of retained 63, 24, and 25, 26, 27, 28 were also evident [Figure 1]a]. 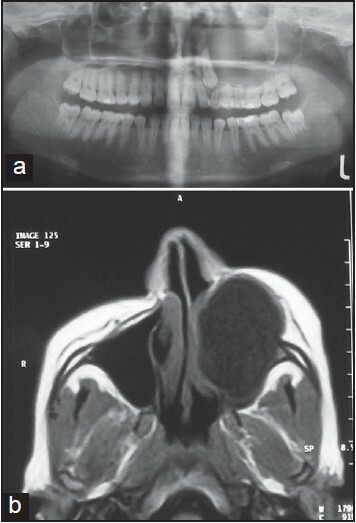 Magnetic resonance imaging scan showed a hyper-radiolucency of 6 cm × 4 cm having comparatively clear demarcation with encroachment of maxillary sinus and erosion of the lateral wall of nose [Figure 1]b]. Odontogenic lesions, especially the radicular cyst, odontogenic keratocyst, ameloblastoma, AOT, ameloblastic fibroma, myxoma, and glandular odontogenic cyst were high on our differential diagnosis as this lesion was noted in the tooth-bearing area of the jaws. Complete extirpation of the lesion was done and submitted for histopathological examination [Figure 2]a]. Macroscopically, the specimen appeared as a solid mass with dimensions of approximately 4.5 cm × 3.5 cm × 4.0 cm with a smooth surface and associated with a well-developed canine crown portion, circumscribed by cyst [Figure 2]b]. Microscopically, the lesional tissue contained a cystic cavity with variable-sized solid nodules of columnar cells of odontogenic epithelium forming nests and rosette like structures [Figure 3]a]. Between the epithelial cells and in the center of the rosette-like configurations, eosinophilic amorphous material "tumor droplets" was present. The duct-like spaces were also seen and were lined by a single row of columnar epithelial cells, with the nuclei polarized away from luminal surface. 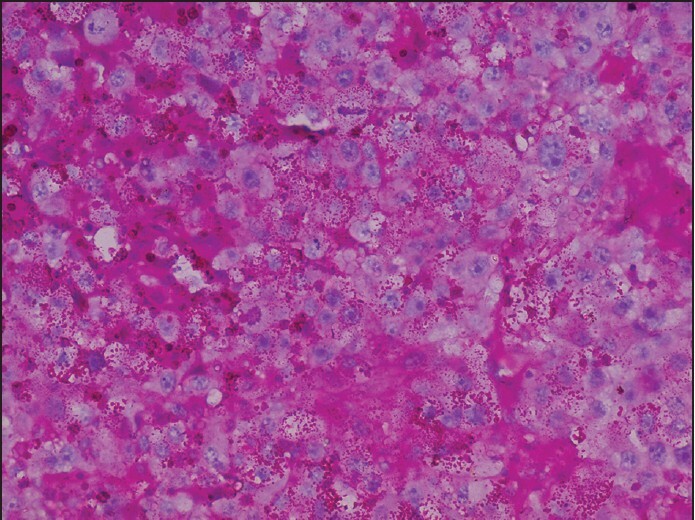 Connective tissue was fibrocellular with areas of hyalinization. 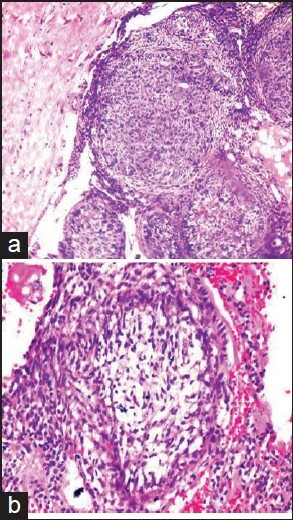 In some areas of this solid nodule like areas, clear cell changes were found which has yet not been reported as a common histopathological feature in AOT [Figure 3]b]. Periodic acid-Schiff (PAS) stain was done and the clear cell origin was confirmed [Figure 4]. The controversy as to whether AOT represents hamartoma-like odontomas or a true neoplasm still persists. ,, Recently, Marx and Stern, in their book argued, this lesion to be a cyst rather than a tumor or hamartoma. They described AOT as a cyst that has hamartomatous intraluminal proliferation of epithelial cells derived from Hertwig epithelial root sheath. Calcifications seen in the histopathological picture are thought to be root dentin induced by root sheath epithelium. Interestingly, we noticed the presence of pigmented cells in AOT during reviewing the literature, where racial pigmentation probably plays an important role. ,,,,, So an extensive review of literature in the last decade did reveal a lot of diverse histologic features in AOT, considering it to be either hybrid lesions or arising along with other lesions [Table 1]. ,,,,, As earlier reviewed by Mutalik et al., of various histopathological patterns in AOT (about 20 in number), inclusive of features seen in their case such as calcifications representing CEOT like areas, hyalinization, dentinoid like areas, etc., but clear cell changes was still not reported. In the present case, the most distinct feature found was clear cell changes in the lesional tissue. Clear cell change can be an indication of the process of cellular degeneration or its odontogenic epithelial origin (diastase digestion PAS positive glycogen content). We did not find any literature earlier reporting AOT with clear cell changes making our case as the first to be reported. As already clear cell change has been associated to aggressive behavior of the lesion, AOT could be considered as a neoplasm after this finding. Despite the ongoing debate on nomenclature, origin of AOT and its diversified histopathological nature, conservative surgical enucleation is the treatment modality of choice as its well established benign course and easy separation of the lesion from its bony crypt because of its thick capsule. ,,,,,, In the present case, though the defect was quite extensive, the surgeons followed the usual protocol of enucleation and closed the defect with bone regeneration graft material. Patient follow-up was done for a year which showed radiopaque areas in gradual follow-up with OPG confirming the reduction in bony defect. Interestingly, the present case had unusual clinical and radiological findings features in contrast to most normal types of AOT supporting its neoplastic behavior. Firstly, in addition to large size with encroachment of maxillary sinus and lateral wall of nose, rapid growth indicates its aggressive behavior. Secondly, the lesion was associated with resorption of multiple teeth which is quite uncommon in AOT as very few similar cases have been reported. Thus, based on clinical findings of the present case indicating aggressive biological behavior, we support the hypothesis suggesting AOT as a neoplasm rather than cyst or hamartoma. Due to the clear cell changes observed, the patient was under customary follow-up for aggressive tendency or recurrence. To conclude though AOT might be under the scanner of controversies, the treatment irrespective of its size and origin remains the same and can be attributed to its capsular nature, but newer techniques considering its histopathological behavior shall be also well thought-out. 1. Handschel JG, Depprich RA, Zimmermann AC, Braunstein S, Kübler NR. 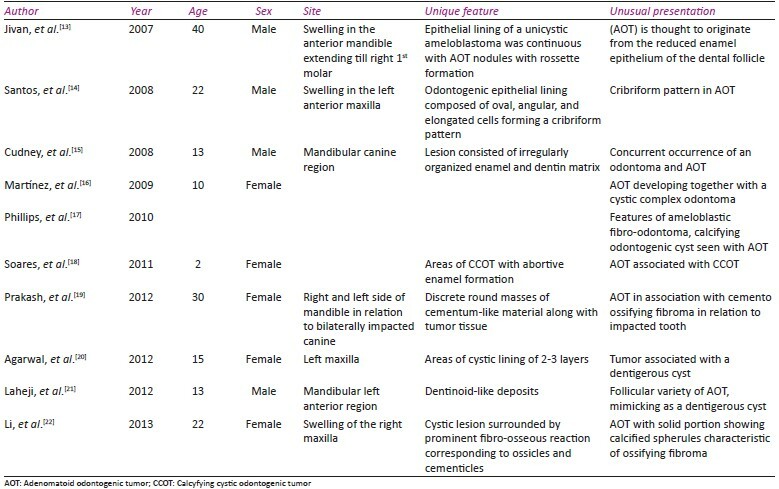 Adenomatoid odontogenic tumor of the mandible: Review of the literature and report of a rare case. Head Face Med 2005;1:3. 2. Ide F, Muramatsu T, Ito Y, Kikuchi K, Miyazaki Y, Saito I, et al. An expanded and revised early history of the adenomatoid odontogenic tumor. Oral Surg Oral Med Oral Pathol Oral Radiol 2013;115:646-51. 3. Barnes L, Eveson JW, Reichart P, Sidransky D, editors. World Health Organization Classification, Tumours Pathology and Genetics, Head and Neck Tumours. Lyon, France: IARC Press; 2005. 4. Philipsen HP, Reichart PA, Zhang KH, Nikai H, Yu QX. Adenomatoid odontogenic tumor: Biologic profile based on 499 cases. J Oral Pathol Med 1991;20:149-58. 5. Philipsen HP, Reichart PA. Adenomatoid odontogenic tumour: Facts and figures. Oral Oncol 1999;35:125-31. 6. Rick GM. Adenomatoid odontogenic tumor. Oral Maxillofac Surg Clin North Am 2004;16:333-54. 7. Crivelini MM, de Araújo VC, de Sousa SO, de Araújo NS. Cytokeratins in epithelia of odontogenic neoplasms. Oral Dis 2003;9:1-6. 8. Tjioe KC, Oliveira DT, Poleti ML, Ferreira O, Sant'Anna E, Gonçales ES. Adenomatoid odontogenic tumour displacing multiple teeth in an adolescent. Open J Stomatol 2012;2:146-8. 9. Garg D, Palaskar S, Shetty VP, Bhushan A. Adenomatoid odontogenic tumor - hamartoma or true neoplasm: A case report. J Oral Sci 2009;51:155-9. 10. Buchner A, David R, Carpenter W, Leider A. Pigmented lateral periodontal cyst and other pigmented odontogenic lesions. Oral Dis 1996;2:299-302. 11. Marx RE, Stern D. Oral and Maxillofacial Pathology. A Rationale for Diagnosis and Treatment. Vol. II. Illinois: Quintessence Publishing Co., Inc.; 2012. p. 639-42. 12. Larsson A, Swartz K, Heikinheimo K. A case of multiple AOT-like jawbone lesions in a young patient - A new odontogenic entity? J Oral Pathol Med 2003;32:55-62. 13. Jivan V, Altini M, Meer S, Mahomed F. Adenomatoid odontogenic tumor (AOT) originating in a unicystic ameloblastoma: A case report. Head Neck Pathol 2007;1:146-9. 14. Santos JN, Lima FO, Romério P, Souza VF. Adenomatoid odontogenic tumor: An unusual case exhibiting cribriform aspect. Quintessence Int 2008;39:777-81. 15. Cudney N, Persico J, Cordell KG, D'Silva NJ. Adenomatoid odontogenic tumor developing in association with an odontoma: Report of a case. Quintessence Int 2008;39:693-7. 16. Martínez A, Mosqueda-Taylor A, Marchesani FJ, Brethauer U, Spencer ML. Adenomatoid odontogenic tumor concomitant with cystic complex odontoma: Case report. Oral Surg Oral Med Oral Pathol Oral Radiol Endod 2009;108:e25-9. 17. Phillips MD, Closmann JJ, Baus MR, Torske KR, Williams SB. 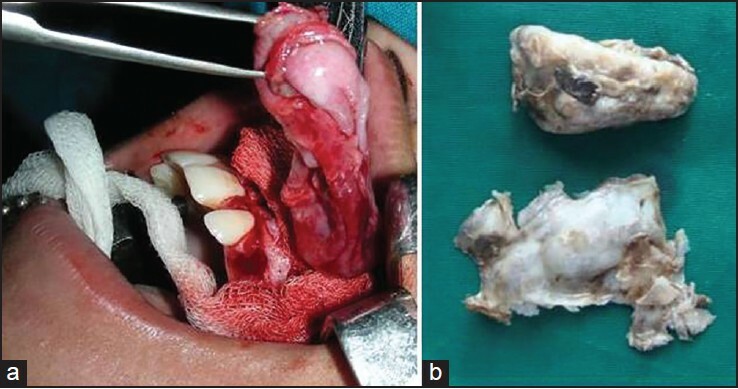 Hybrid odontogenic tumor with features of ameloblastic fibro-odontoma, calcifying odontogenic cyst, and adenomatoid odontogenic tumor: A case report and review of the literature. J Oral Maxillofac Surg 2010;68:470-4. 18. Soares EC, Costa FW, Neto IC, Bezerra TP, do Socorro Vidal Patrocínio RM, Alves AP. Rare hybrid odontogenic tumor in a 2-year-old child. J Craniofac Surg 2011;22:554-8. 19. Prakash AR, Reddy PS, Rajanikanth, Bavle RM. Concomitant occurrence of cemento-ossifying fibroma and adenomatoid odontogenic tumor with bilateral impacted permanent canines in the mandible. Indian J Dent Res 2012;23:434-5. 20. Agarwal A, Giri KY, Alam S. The interrelationship of adenomatoid odontogenic tumour and dentigerous cyst: A report of a rare case and review of the literature. Case Rep Pathol 2012;2012:358609. 21. Laheji A, Sakharde S, Chidambaram S, Gondhalekar RR, Shankar U, Radhika A. Adenoameloblastoma: A dilemma in diagnosis. J Contemp Dent Pract 2012;13:925-9. 22. Li BB, Xie XY, Jia SN. Adenomatoid odontogenic tumor with fibro-osseous reaction in the surrounding tissue. J Craniofac Surg 2013;24:e100-1. 23. Mutalik VS, Shreshtha A, Mutalik SS, Radhakrishnan R. Adenomatoid odontogenic tumor: A unique report with histological diversity. J Oral Maxillofac Pathol 2012;16:118-21.